For McDonough and Braungart, the questions of resource scarcity and sustainability are questions of design. They are practical-minded visionaries: They envision beneficial designs of products, buildings, and business practicesand they show us these ideas being put to use around the world as everyday objects like chairs, cars, and factories are being reimagined not just to sustain life on the planet but to grow it. It is an eye-opening, inspiring tour of our green future as it unfolds in front of us. The Upcycle is as ambitious as such classics as Rachel Carson's Silent Springbut its mission is very different. McDonough and Braungart want to turn on its head our very understanding of the human role on earth: Instead of protecting the planet from human impact, why not redesign our activity to improve the environment? We can have a beneficial, sustainable footprint. Abundance for all. The goal is within our reach. William McDonough is an American architect and founding principal of William McDonough + Partners. Michael Braungart is a German chemist. Together they cofounded McDonough Braungart Design Chemistry, and in 2002 they coauthored Cradle to Cradle. The main idea of The Upcycle is that the idea of lowering one's carbon footprint is too negative. Instead humanity needs to seek out sustainable abundance through intelligent and sustainable use of resources. I really like the idea of this, go back to the start redesign your process to adhere to a “Triple Bottom Line” according to your values. But the last part of that sentence is where I get stuck, “According to your values” I'm of the strong belief that most companies are amoral, and are going to do whatever they can to make money now. Unless, they are being led by someone who is able to steer them towards this mythical “Triple Bottom Line”. This becomes more troublesome when the company is a public company. With all that said, I do believe that the premise of this book is entirely achievable, but it's going to take a major philosophical change. We need design for perpetual use, not just for first use. 1. The book takes a negative stance towards environmental regulations despite the good that they do. 2. In regards to point #1, the authors are in the business of selling the sustainability idea to business executives that are not too fond of regulatory requirements. 3. Sometimes the examples are overly simplistic for something as complicated of a change as the authors are proposing. 4. Much of what they authors are proposing are conventional wisdom, renewable energy, non-toxic manufacturing, design for re-use. This is a well written book that may be simplistic on purpose. Once businesses decide to take the reusable design road there will be many obstacles to over come and that will be their job, not the authors in this case. There is an inertia problem with companies currently, and the time and cost for a large company to move down the renewable route is something many of them cannot afford. 5.0 out of 5 starsPracticle ways to have an effect on the invironment for business and individuals. The Upcycle: Beyond Sustainability--Designing....; This book and it's companion (written first) Cradle to Cradle describe how in practical terms people and businesses can affect the health of the planet. The authors are/have worked with companies and governments to put their theories into practice. It works and those companies who have gone that route have saved money and improved the environment around them. Individuals can also follow many of their ideas to improve our lives and the environment. The choices can be as simple as planting trees, recycling and buying products from companies who follow the authors stands to putting solar panels on your roof. Read the books, get to work. 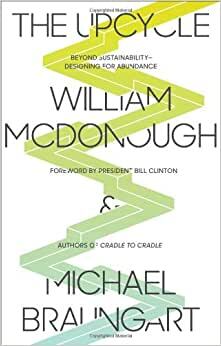 William McDonough, an American architect, and Michael Braungart, a German chemist, combined to write Cradle to Cradle (C2C). C2C, published in 2002, discusses product design, with emphasis on materials utilization efficiency in an environmental context. C2C proposes that product design consider negative effects, especially toxicity, to humans and the natural world at every step in the product's value chain, including disposition when the product is no longer useful. In essence, C2C goes beyond "cradle to grave" design, which ends at a landfill or an incinerator, to "cradle to cradle" design, where non-toxic materials are reclaimed, recycled or reused in generation after generation of products. Recently, the same two authors published The Upcycle. The Upcycle isn't really a sequel to C2C. Rather, as its title implies, it is an expansion on C2C, based on experience -- in this case, two decades of experience. Think of The Upcycle as another generation of the same product, rather like release 1.0 and release 2.0 of a software package. >> Design as a latchkey to abundance: I bought The Upcycle because of its subtitle: Beyond Sustainability -- Designing for Abundance. The book proposes that design -- tangible product design, as well as process and systems design -- can lead to upcycling, and that an emphasis on upcycling leads away from a world of scarcity to a world of abundance. >> "Biosphere" vs. "Technosphere": The Upcycle distinguishes between the "biosphere" -- the natural world and its biological cycles -- and the "technosphere" -- the realm of the synthetic. Natural products and natural cycles provide models for design within the technosphere. However, the recovery processes in the two spheres differ significantly, such that mixing natural materials with synthetic materials in the same product may impair upcycling. >> Regarding toxicity: C2C and The Upcycle both regard toxicity as both cumulative and pernicious. Cradle to cradle design relies on detailed assessment of the potential toxicology of all components of every material used in the manufacture of a product. The level of concern goes well beyond most governmental regulations on toxicity, as they existed at the beginning of the current century. The Upcycle provides the term "enchanted skepticism", which describes my general reaction to that book. Many of the ideas are fascinating. I'm quite convinced that radical improvements in materials utilization, across product generations, are possible. Recent product and process design innovations in the automobile industry and in building construction present interesting cases in point, although The Upcycle affords little attention to either. However, favorable examples are one thing. Broad practicability across a wide range of manufactured products may be another.